Tallinn ferry port is located on the Gulf of Finland, on the Northern coast of Estonia. Tallinn is the capital city of Estonia. The ferry port of Tallinn is the biggest and rapidly developing cargo and passenger port not only in Estonia but also in the surrounding Baltic region. 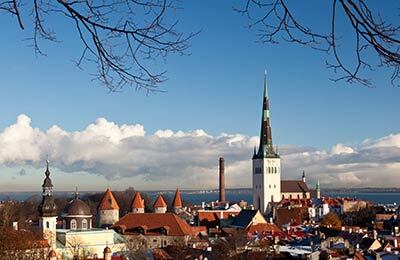 Ferries from Tallinn sail to Helsinki in Finland with Viking Line ferries and Tallink. You can also find ferries to Mariehamn and Stockholm with Tallink. Using the simple booking form from AFerry, you can easily find the right ferry for you. 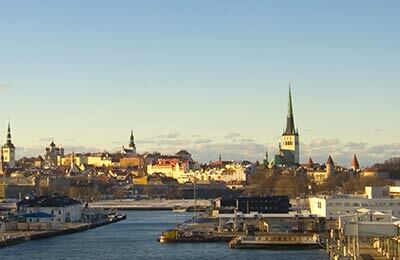 Below you can find Tallinn ferry times, as well as our best deals. The latest check in time for Viking Line and Tallink ferries is 60 minutes before departure. Tallink provides a wide range of modern onboard facilities including restaurants, bars, disco, business lounges, wireless internet connections, TVs, shops and children's play areas. Viking Line Ferry service offers a wide range of entertainment and other facilities including quality restaurants, bars, lounges, relaxing saunas and swimming pools and a number of other spa and recreational facilities onboard their modern and comfortable ships. Eckerö Line operates one of the largest ships on the Baltic Sea, the M/S Nordlandia. The ship can carry over 2,000 passengers and has various on board food options available on the famous deck 6. St. Peter Line has comfortable ships that boast a full range of on board services, including casinos, reception areas, range of on-board restaurants and bars. There are frequent special events on board the ships to provide added excitement to the crossing. Cabins come in a range of styles and sizes. The Tallinn ferry port is located just a short distance away from the old medieval town and has 4 modern ferry terminals. Tallinn ferry port facilities include information centres, bureau de change, cash machines, pharmacies, luggage rooms, bars and shops etc. Viking Line operates from terminal A in the ferry port. Tallinn ferry port is only 0.8 Km from the city centre, ferry terminal is clearly sign posted from all directions. Please note all motorists must use headlights at all times in Estonia and sounding horns is illegal except in extreme dangerous conditions. Trains connect from Moscow and St. Petersburg to Tallinn everyday. From the train station, tube number 1 and 2 connect to the Ferry port, or it is just a 10 minute walk. Various international bus services connect Tallinn to Germany, Russia, Latvia, Lithuania, Poland and Switzerland. Domestic services are also available. Both international and domestic buses arrive at Tallinn's central bus station; from where tram number 2 or 4 or local buses 17A, 23 and 23A connect to the Tallinn ferry port.